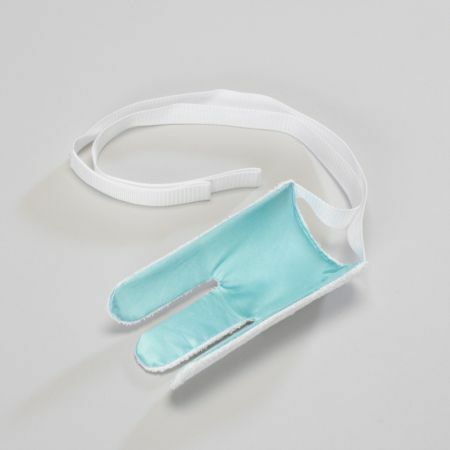 Flexible, Plastic Sock Aid - Terry Cloth. Length 230mm. Sock application is made easy with this flexible, plastic sock aid. Slits in the plastic core allow it to bend around the heel. The inside is lined with nylon to reduce friction and the outside is lined with terry cloth to hold the sock firmly until it is on the foot. Two pulling tabs permit one-handed application. What a difference it has made; the hardest and most painful task of the day was simply putting a sock on! Now it's a doddle. Personally I find this brilliant to use and it has really helped me put on my socks. However, it's a bit fiddly at first to get all three prongs into the sock and it was my husband who actually commented that it would be difficult for people with arthritis in their hands to manage as the prongs are quite stiff and springy. So 5 stars from me but for others, it depends on their disability.